These strawberry book reviews highlight some of the best works on strawberries ever written. Besides being delicious, strawberries are also very interesting! If you like strawberries and reading... or if you just want to take your strawberry love further... then check out these strawberry book reviews! Only some of the most important texts about strawberries are included in this list. And, as with other things on this site, these books are family friendly. Quest for the Perfect Strawberry by Herbert E. Baum (2005). Strawberries by Jim F. Hancock (1999). This book also commits several pages to the history of the strawberry. However, it is perhaps most valuable for it's material on the breeding and raising of strawberry plants, and the harvesting and processing of strawberry fruit. 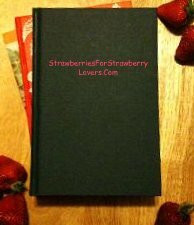 (Note: these strawberry reviews are given simply to introduce strawberry lovers to some great written works about strawberries. Please do the right thing and respect any copyrights associated with these writings.